There once was a Prince Archbishop of Salzburg named Leopold Anton Eleutherius Freiherr von Firmian, who was a descendant of a century-old, South Tyrolean noble family. 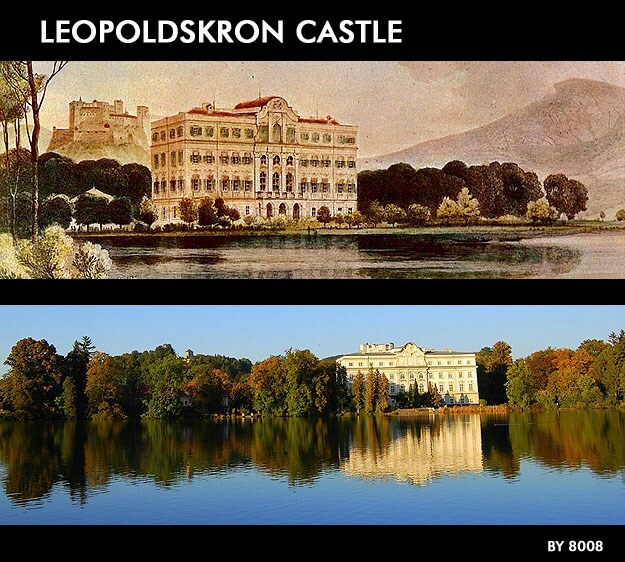 In 1736 he named his newly acquired property LEOPOLDSKRON, a combination of his first name Leopold and the second part of "Mezzocorone", his home town, which translated into "Krone", the German world for "crown". Although Firmian was highly educated in the sciences and had a fine appreciation for art, he was nevertheless responsible for the expulsion of 22,000 Protestants from Salzburg, which greatly harmed his family’s reputation. Thus he instructed the Scottish Benedictine monk Bernhard Stuart to design the rococo-palace as a prestigious family residence in an effort to partially restore the family’s social standing. In 1965 the film The Sound of Music, directed by Robert Wise and starring Julie Andrews, was produced in Salzburg with the grounds adjacent to those of Schloss Leopoldskron as one of the main locations. The palace was never used as the back of the Von Trapp villa, although even some tours of Salzburg claim that it is. Scenes filmed on the adjacent property (known as Bertelsmann, at the time), include the family drinking pink lemonade ("not too sweet, not too sour, just too... pink!") on the terrace, Maria and the Captain arguing on the terrace, and the children falling off the boat in the lake. Only shots showing the lake, were filmed there, using a replica of Leopoldskron's terrace, and horse-gates, leading to the lake. Any shots showing the building itself, were filmed at Schloss Frohnburg. The ballroom for the interior shootings, which were done in a studio, is a copy of the Venetian room from the palace. The setting for the two main love scenes, one between Liesl and Rolf (featuring the song Sixteen Going on Seventeen) and the other between Maria and the Captain (Something Good) was the glass gazebo originally situated in the garden of the palace. The gazebo was later moved to the other side of the lake to allow tourists to visit it, but after their numbers became to big it was again relocated to the Hellbrunn Palace outside of the city.